Extremely clean room, staff was so helpful and nice! I’m so in love with this hotel!! I very much liked the host (Dimitry) who was exceedingly helpful. The view was also incredible! The location is great. View was great. Breakfast delivered to the balcony. Our room was lovely though the bathroom was limited to people 5' 10' inches and under. We loved the hot tub, the shower, the bed, the balcony setup, the storage space. Our friend's room was huge, with two couches, a table (we played bridge), and a normal height bathroom. They loved it. These villas are INCREDIBLE!! The view is outstanding, in my opinion the best you can get anywhere on the caldera. The host Dimitri was very nice and helpful. Short 5 min walk from the main Oia strip - the best area in Santorini. Sunset views from the villas are peaceful and even better than walking into town. Area was very quiet and relaxing. Breakfast was delicious! Best honeymoon ever!! Everything was wonderful, the room, the view, th hosts and our expectations were exceeded. Our host Dimitri was extremely helpful with all aspects of our stay and he personified the Greek term 'filoxenia'. We will definitely return and stay for a longer period of time. The hosts were amazing, very friendly and kind. They were awaiting us on our arrival and helped with the bags. The accommodation was lovely, the view was outstanding and so handy to the stunning Oia Village. We didn't want to leave and we will definitely return to Rimida Villas again. 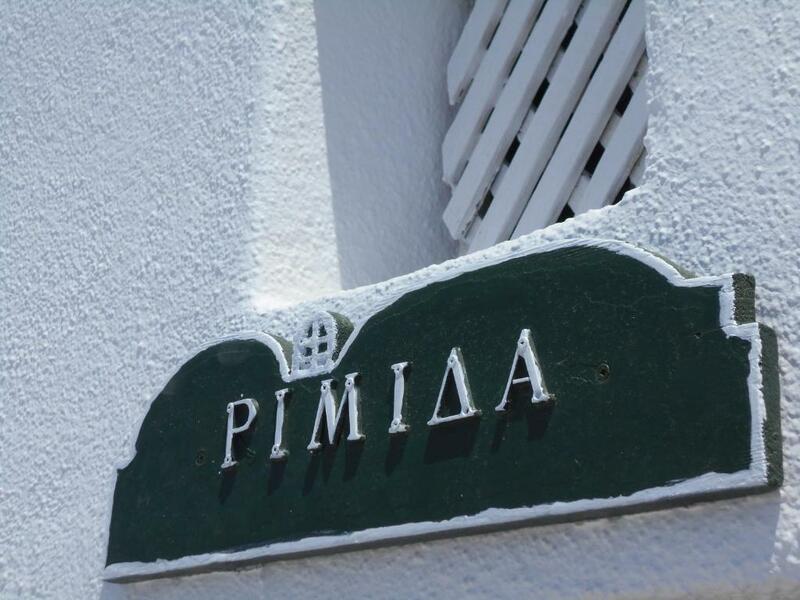 Lock in a great price for Rimida Villas – rated 9.4 by recent guests! One of our top picks in Oia.Rimida Villas is a group of self-contained traditional dwellings, located in the picturesque area of Perivolas, on the outskirts of Oia. Guests enjoy Caldera, volcano and sea views from their private terraces. All studios and apartments are furnished and decorated in characteristic Santorinian style. Beds are stone platforms carved from the rock, while kitchenettes add a homely feel. Modern touches include an LCD TV, and CD/DVD player. Breakfast is served each morning on your private terrace. Numerous restaurants serving local and international cuisine, bars and wine cellars can be found within a 10-minute walk. Rimida Villas lie 0.6 mi from Ammoudi beach, and enjoys direct access to the main road and the rest of the island. Fira is 6.8 mi away and the airport is at 11 mi. Car rental, or port and airport transfers can be arranged, upon request and charge. Free Wi-Fi is available in the common areas. When would you like to stay at Rimida Villas? This air-conditioned, with private entrance studio features a tile/marble floor, an electric kettle, a CD player, a DVD player. Bathroom comes with a toilet and a shower. A flat-screen satellite-TV is available. A kitchen with cooking amenities is offered. This air-conditioned apartment has a tile/marble floor, bathrobe and kitchenware. Bathroom comes with a toilet and a bath/shower. A flat-screen satellite-TV is offered. Kitchen offers kitchen amenities and a refrigerator. 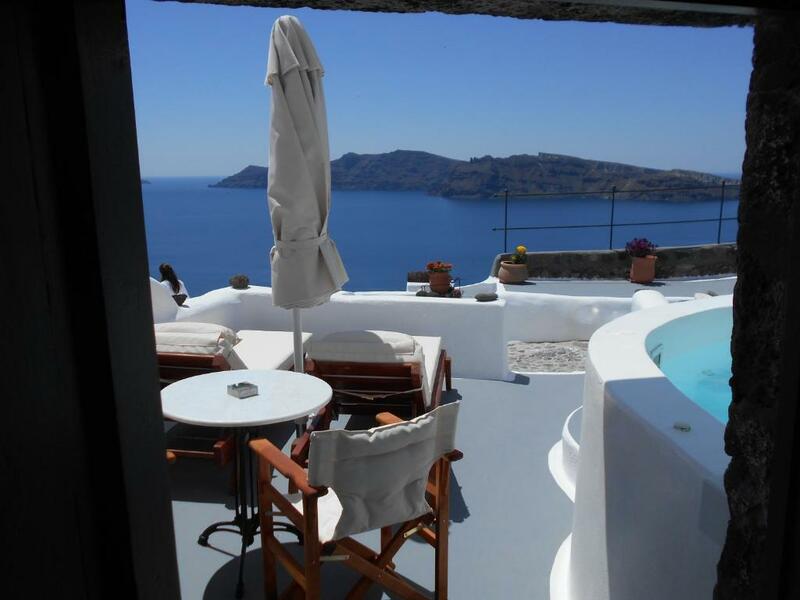 This traditionally decorated cave house opens to a private, furnished balcony overlooking the caldera and featuring a hot tub. It has a kitchenette with a small dining area, and a bathroom. Featuring an indoor hot tub, this air-conditioned cave house opens to a private, furnished yard overlooking the caldera. A private entrance is offered. Guests are benefited with a flat-screen satellite-TV, a tile/marble floor and a sitting area with a sofa. Cleaning products and cooking amenities are provided. This spacious cave house opens to a private furnished terrace with cave-style hot tub and views over the caldera.It includes a bedroom with built-in bed, a seating area with built-in sofa, a kitchen and a bathroom with shower. Each house has its own history at least 150 years old. House of our grandfather, store, canava( where they made wine in the family), stables for animals and other facilities were rebuilt and now become great venue hosting that make our customers to feel like home! House Rules Rimida Villas takes special requests – add in the next step! Rimida Villas accepts these cards and reserves the right to temporarily hold an amount prior to arrival. Please note that no extra beds or baby cots can be added in any of the room types. All rooms can accommodate strictly 2 adults. Please note that the property does not have a swimming pool. Please inform Rimida Villas of your expected arrival time in advance. You can use the Special Requests box when booking, or contact the property directly using the contact details in your confirmation. The highlight of our Greece trip was actually our stay in Rimida! 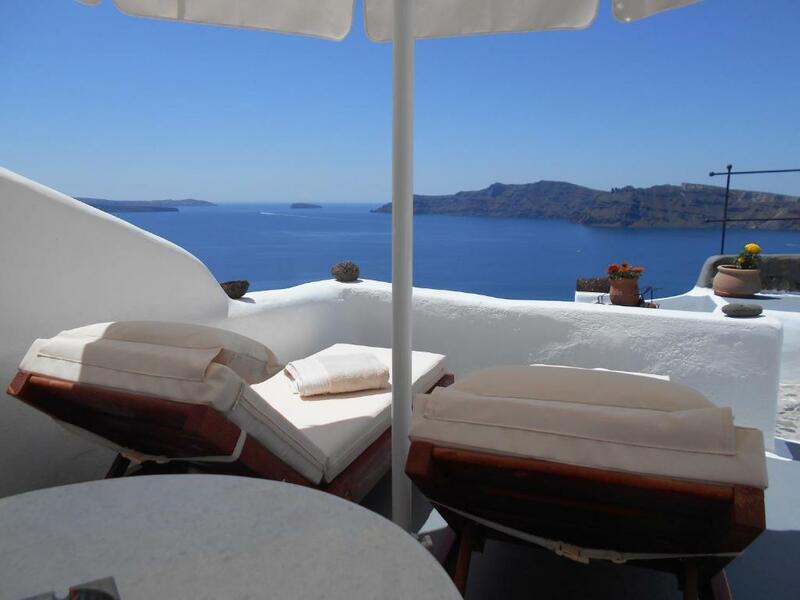 We have made the right choice to book there and we are lucky that the view was fantastic because from Rimida we can see beautiful Oia building. Most important the uncle and one younger man who served us was very friendly and helpful. The uncle prepared our breakfast, help us to take pictures and keep asking if everything okay. Rimida has given us unforgettable moment with the beautiful cave house and Jacuzzi and beautiful view, we are literally staying facing the caldera sea. It’s amazing experience. It was very relaxing and quiet, great service given to us and we will definitely recommend friend and family to stay in Rimida. we already missing your Vila now, with amazing view. We will be back :) Thank you Rimida Villas for making our honeymoon so enjoyable and unforgettable. We loved every minute - we had such a gorgeous apartment and the owner was wonderful. Location was amazing and the views were stunning! the view is so beautiful with private external hot tub. Really quite area and not far from central of Oia. Rooms have been improved since the last time I came. It is more modern and the staff is always as kind as in the past. location is just amazing. Absolutely nothing. This is our best trip so far. I can’t think of anything to make it better. Loved the personal touch from the hotel staff and especially Dimitri who went out of his way to make my Fiancé’s birthday extra special by gifting us with Prosecco and a delicious chocolate cake with candles and matches. He recommends various trips to take and excursions to do and was helpful from the morning to the night with any questions we had or bookings we needed to make he took care of it all. We loved every minute of our stay. It was private with a jacuzzi and the most breathtaking views of sunset and the caldera. Will definitely be back. Only the pillows were little bit high and hard but still ok. The view! OMG! This is the best place to enjoy the sunsets! Its very quiet part of the caldera where you can relax without having all tourists passing the property! The host was very kind too. The floor of the room and especially the bathroom need a refresh, but this wasn’t that bad and the hot tub/calmness/private terrasse make you forget this ! 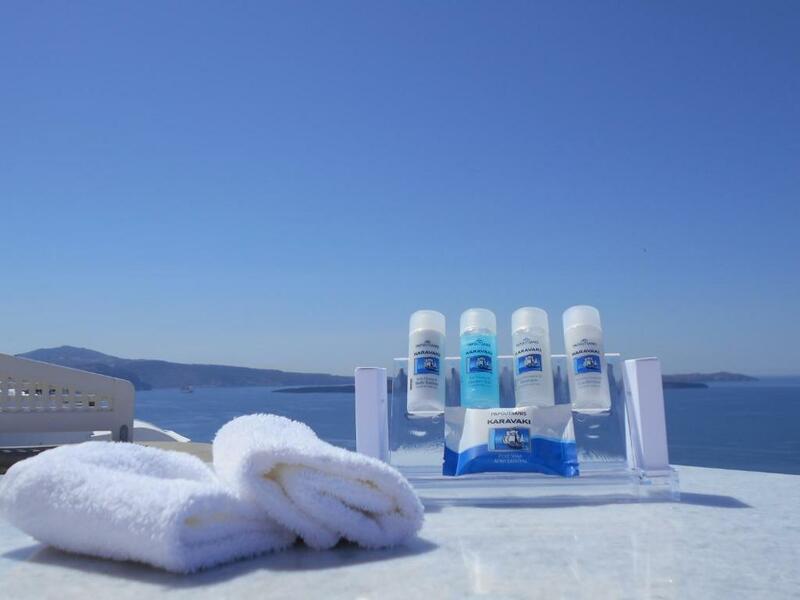 Very impressive and nice view, absolutely calm and a very nice staff ! Perfect location, private with unforgettable views of the caldera; situated away from the general foot traffic and major tourist walkways. Our host was friendly, efficient and a wonderful source for organising a car rental and transfers - nothing was too much trouble. An absolutely delightful and generous breakfast provided. Would DEFINITELY STAY AGAIN. Worth every dollar spent. Bravo Rimida and thank you very much for everything you’ve done for us. It was a complete experience. The hosts, Dimitri and Gioula, offered us the best advices starting from renting a car, where to eat best and perfect spots for pictures and sunset. More than this, the hosts agreed to be part of preparing a special moment for my girlfriend, and they took care of everything. They organized on my behalf a romantic set up and it was just perfect! Regarding the facility and cleanliness, it was just as expected. Nothing to complain about. And we had an amazing view of Oia and the famous Santorini sunset exactly form our apartment. Bravo once again and I hope to see you soon! The service and view were really amazing.